Base Damage Rating is an average damage number that is calculated by the numbers on image below. The easiest way to calculate BDR is min damage + max damage /2 = average damage. The value of this number is not an accurate way to display weapon strength, I will explain this later. Even a level 2 weapon can look amazing if we add bonusses to enhancement and Weapon dice multiplier, lets break it down. Critical hit multiplier is x2, so critical hits are 33 damage on average. 16 nomal rolls and 4 critical hit rolls, so 16 x 16,5 = 264 + (4 x 25 = 132) = 396 average damage over 20 rolls. 396 / 20 = 19.8 Base damage rating. 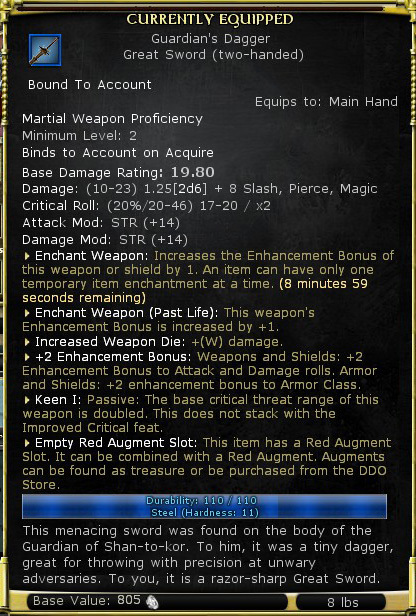 *note, I used +1 from epic past life, +1 from harper tree, +1 weapon enchant spell, +3 shield mastery enhancement and 0.25W from ship buff to increase the weapon with +3 enhancement and 0.25W damage. Bard Swashbuckler “Exploit weakness” stackable insight +1 every time you damage and enemy but do not crit. How high can Base Damage Rating go? 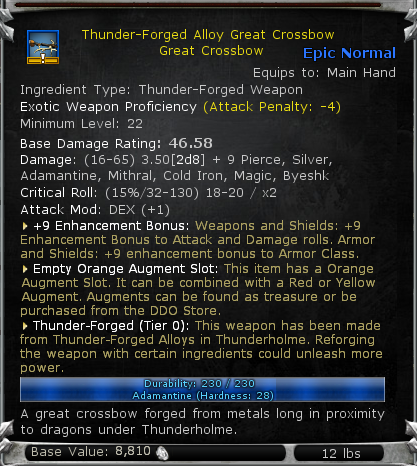 well, the highest BDR weapon I know is the Thunder-forged Great Crossbow at 46,58 BDR on tier 1. We will have to add as many improvements to the enhancement level and weapon dice multiplier, crit range/multiplier as possible. 83.5 avg x 16 + 4 x 250.5 = 2338 / 20 = 116.9 Base damage rating. The current Base damage rating system has some flaws. – The calculation in min/max damage is rounded down, stealing some damage on display. – Damage display is missing some properties, in example, it calculates how much the Keen property impacts damage, but not the Improved critical feat, while some other enhancements do get displayed. – Inaccurate indication of weapon potential, but I understand addition damage sources are influenced more by enemy type then the raw damage output. With all these flaws let’s review how things would look if they did display the other weapon properties or feats that also affect damage. – Improved crit not getting added to BDR while keen does. Weapons do not display the elemental/alignment damage, probably because it depends on the enemy if those attacks will deal any damage at all. For this I have a solution, brackets. 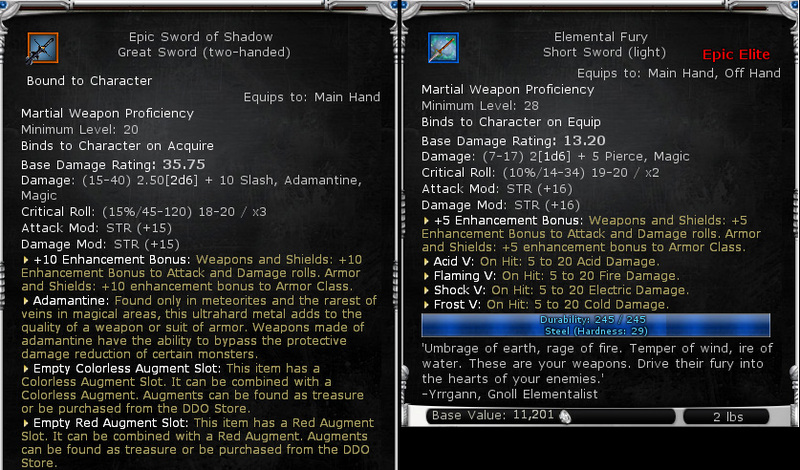 To compare I have the ESOS and Elemental Fury, big difference in Base damage rating. I won’t fill up the augment slots because I only want to show how much difference additional sources of damage can make compared to what BDR says. The latter is a huge difference compared to the raw damage and in my opinion it gives a much better indication of the weapon’s power. in your max base damage calcs,there are a few holes. the stalvart defender bonus is added t oshields,right? os it should not work on the great xbow. also the TF bonus to 2hw,will it effect it? also, trees like swashbuckler can greatly increas enhancment,so it may bypass it if maxed out. how abour the rogue mechanic core that boosts Great Crossbows? Should be fun to add.